At Platusic Design Creative Studio we work with you to create a custom invitation design that suits your style and budget needs. Below is a starting from price point for the different invitation styles available. As you can imagine, there are many variables that influence price, i.e., quantities, styles, paper selections, number of enclosure cards, embellishments etc. Once you make all your selections and all the details are finalized, a custom quotation will be prepared for you. A minimum investment usually starts at $500-$1500 depending on the styles you choose. REQUEST A QUOTE OF YOUR FAVOURITE DESIGN. If you are searching for a unique embellishment we will try our best to accommodate your request. Delivery & Shipping is available for an additional fee, and calculated upon order completion. Should you wish a completely custom creation, a flat rate design fee of $150(from) will be added to your order. 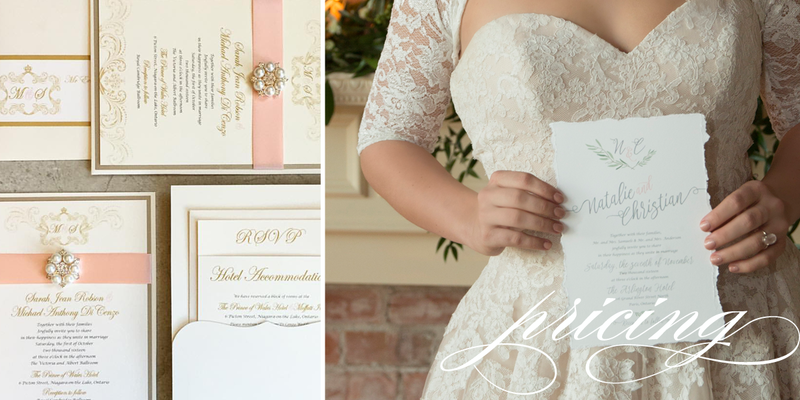 This will include the design layout of all your pieces, and matching event stationery. Applicable taxes are extra and will be added to your order. Note: starting from prices are based on a quantity of 100; should you have a larger order please send the details and a volume pricing discount may apply.